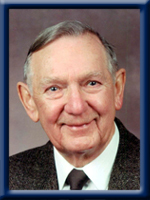 TOMBLIN; Harry S., 88, of Greenfield, Queens County, passed away peacefully in South Shore Regional Hospital, Bridgewater on Monday, July 15th, 2013. Born in Middleborough, Yorkshire, England, he was a son of the late Sydney and Ethel (Spanton) Tomblin. Harry was a veteran of World War Two serving with the Royal Air Force as a WO1 Air Gunner in South East Asia. Following the war, he worked as an automotive accountant. He was a former member of the Fredericton Barbershop Quartet. He is survived by his wife D. Marie (Milbury); his sons Gordon (Lucille) of Kentville and Mark of Sylvan Lake, AB., his grandchildren Kyle, Kurt, Alyssa and Jesse and his great grandson Kayden. He was predeceased by his infant daughter Dianne and his sisters Louise and Joyce Tucker. I was with the Halifax Herald back in the late 60’s doing advertising. I often visited Forbes Chevrolet and had many chats with Harry, while doing business with Lawrence Myers and Don Young. This fine gentleman will be sorely missed. My deepest sympathies to the family. You are in my thoughts and prayers. Len Wile. Dear Marie, we are so sorry to hear of your loss. Please know that we are thinking of you and you have our deepest sympathy. Praying that God will grant you peace and comfort through this sad time. so sorry 4 your loss; Marie;its a lonesome life to be alone. Harry was a joy to meet. I will never forget my visit to the home on the lake where he cared for the neighbors dog and was an active watcher of the nature all around him. Loved his sense of humor and the twinkle in his eye that he passed along to Gordon. My own mother passed at the same age and shared the Alzheimer journey. Blessings to Marie and the family as they celebrate a life well lived. Dear Gordon, Lucille and family, so sorry to read of your fathers passing, may fond memories be with you always. Thinking of you all at this sad time. It was a shock to see Harrys passing this am.I wish we had been able to get together more often. I was very saddened to see this but I have some great memories, having a coffee an sharing laughs over your trips to cottage with the dog. I will always have fond memories of you an Harry. Bless you an your family..
ON BEHALF OF THE ROYAL CANADIAN LEGION, BRANCH #69, OF SAINT JOHN WEST, I WOULD LIKE TO TAKE TIME TO SEND OUR LOVE, PRAYERS, AND HEART-FELT SYMPATHIES TO YOU ALL, AT THIS SAD TIME OF LOSS. HARRY WILL BE MISSED GREATLY BY HIS COMRADES LEFT BEHIND, AS WELL AS HIS FAMILY AND FRIENDS, BUT WE UNDERSTAND THAT GOD KNOWS BEST. MAY GOD GRANT YOU PEACE, CONTENTMENT, AND AS TIME GOES ON, MANY SMILES, AS YOU REMEMBER HARRY’S GOOD TIMES AND FOND MEMORIES OF THE PAST! GOD BLESS YOU WITH HIS LOVE AND WARMTH! Dear Marie: We haven’t forgotten you and we were so sorry to read of your husband’s passing in today’s Telegraph. Please express our sympathy to your family as well, even tho’ we don’t know them. I, Elaine, will never forget you even if we don’t keep in touch – perhaps we can do better! Our love and praying for you. TS Construction from NOVA Chemicals Joffre, AB. On Behalf of TS Construction from NOVA Chemicals Joffre, AB, we would like to extend our deepest sympathies to Mark and the Tomblin family on such a terrible time. We were all deeply sadden to hear of Mr. Tomblins passing. Marie- Sorry for your loss. Good memories when you were our neighbors in Dartmouth and I was your paperboy. Please accept our sincere condolences. I worked with Harry at Forbes Chevrolet for many years, until his retirement. Harry was a very pleasant man to work with. We are thinking of you at this time. To Marie and family, Bruce & I extend our deepest sympathy on Harry’s passing. Marie, our deepest sympathy goes out to you and your family at this difficult time. Harry will be sadly missed. Dear Marie, & Gordon & Lucille…I am so sorry to hear of your sad news. Please accept condolences from my mother and myself. We sure had a lot of great laughs over the years. Harry was a real joy to be around and truly did have a sparkle in his eye. Although words cannot help ease your loss, please know that you are in our thoughts and prayers. So sorry to hear of Harry’s passing, you and your family are in my thoughts at this most difficult time. I will miss not seeing Harry at the dealership always enjoyed his stories, he will be greatly missed. So sorry to read of Harry’s passing. I worked with Harry at Forbes Chevrolet. He was a lovely man and a pleasure to work with. I remember his laugh and his smiling face. My thoughts and prayers are extended to you at this sad time. So sorry to hear of Harry’s passing and we send our condolences, thoughts and prayers. Extending deepest sympathy to you, always enjoyed listening to Harry’s stories. We were very sad for you and Lucille when we heard of your dad’s passing. Our thoughts and prayers are with you. Dear Marie and family: We were so sorry to hear of Harry’s passing. I will always remember Harry’s sense of humor no matter when you visited. God bless you Marie. Dear Marie and boys with or loving sympathy. Those who touch our lives stay in our hearts forever. You’re in our thoughts ,we hope you’ll remember how much we care and our memories are filled with love. I will never forget the New Years whaler races,what fun. Some lives are like a song-every note rare and precious. We feel lucky to have heard the music. We are very sorry to hear of your Dad’s passing. Thoughts and prayers go out to you and your family. Sorry to hear about Harry’s passing!